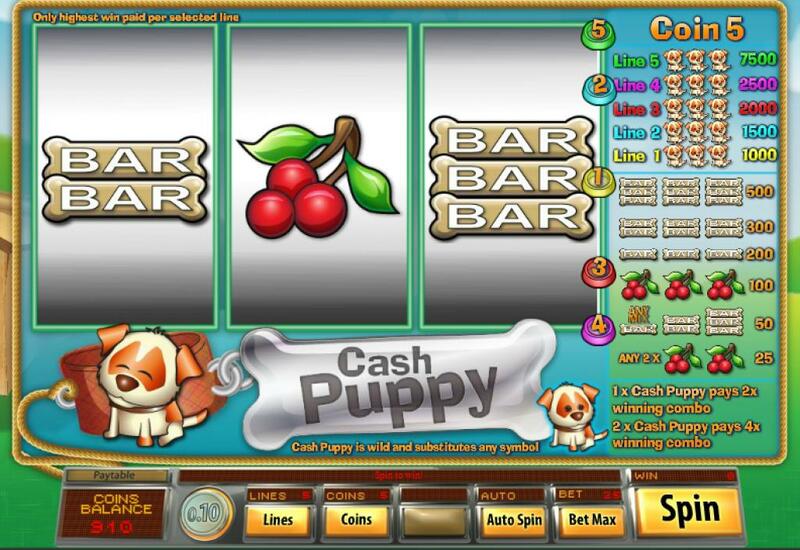 Cash Puppy is a cuter slot machine than you’re probably used to seeing in the classic category, and despite its use of 3 reels you will find great graphics inside, along with some features which are good, but far from unheard of in titles of a similar nature. Created by Saucify, it’s clearly designed to appeal to the eye, and it’s one of the few that actually succeeds at this. Just like the title mentions, the theme is related to puppies, but even though they’re cute, the ones visible here are not nearly as great as the real thing. A big part of the design is classic actually, the way so many other 3 reel titles are. This classic slot machine has 3 reels and as many as 5 paylines arranged on them. The features are the wild symbols and the multipliers they apply. The game’s biggest prizes will offer you $7,500. If you want to get bigger payouts, I suggest you hope for the wild symbol and the multiplier that it brings with it. Each wild you get on the payline will add a 2x multiplier to the prize that comes out of it. With one wild, the prize of the win will be doubled, if the substitution ability was used. With two wild symbols being part of a payline and helping form a combo, the reward will be at 4x the usual amount, since both multipliers get applied to the win. The presence of three wilds, all on the same active line, will get you a prize. The first line combo awards the least, 1,000 coins. On the second line, the payout is at 1,500 coins. The third line gives you 2,000 coins if you get these symbols on it. The fourth line pays up to 2,500 coins. Finally, we have the fifth line, which pays the most for a combo of three Puppy wilds. You get 7,500 coins from it ($7,500). Each coin that you choose to use will have a value between $0.01 and $1. You can use up to 5 coins, activating the same number of bet lines. That’s a $5 maximum bet. You can get a top payout of 7,500 coins, or $7,500, as long as the three wilds form their combo on the 5th line. If they do it on another line, the prize could be as low as 1,000 coins. The design looks cute, there is no question about that. Being themed around puppies, it also has the advantage that it doesn’t seem to be trying to get away with the least amount of effort possible. The developers worked harder on this game than they did on most of the classic titles they put out. You have a background with green rolling hills, with a dog house in a corner, and the game area which includes the logo, the paytable and the reels. The symbols are part classic, but some of them were made based on the theme (dog bones instead of bars). Symbols: Puppy (wild, 7,500 coins), Three Bones (500 coins), Two Bones (300 coins), One Bone (200 coins) and Cherries (100 coins). It’s a lot cuter than other slot machines with the same layout, even though it still uses classic elements. I guess puppies really do make everything better. 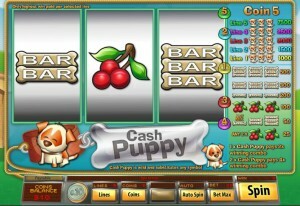 You will find Cash Puppy 3 Reels at any online casino which chooses to use software from Saucify, playable either for free or for real money.